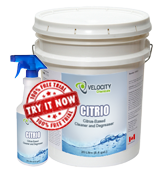 CITRIO is a powerful water-based citrus cleaner and degreaser. It is used to clean various soils, including bitumen, fuels, greases and oils. CITRIO can also be used to clean any other metal surfaces soiled with fuels or oils where a solvent-based cleaner is not desirable. Light to Medium-Soiled Surfaces – dilute product from 1:20 (5%) to 1:1 (50%). Let stand for 3 to 5 minutes, scrub and then rinse thoroughly with water. If necessary, rinse with pressure washer for hard to remove soils.